We’re sorry we took so long to write this article, didn’t mean to make you all wait, but good things take time to create! Here we are, sitting together in a small cafe in Berlin with a nice cup of coffee talking about how to put our feelings into words. Most of you already know the story of our career, and how we casually ended up skating together, but everyone knows life can be both unpredictable and beautiful. It is with heavy hearts that we confirm that we are not skating together anymore. We need to clarify that the reason is not the one you read on other articles about finding a compromise training place! This decision has not come lightly, and we know that many of you will be disappointed. The time has come to move forward on our individual career paths. Tanja wants to concentrate on her University studies and start the coaching career in Berlin and Stefano didn’t decide yet. Going forward, you can expect exciting things from each of us, and we will of course continue to support each other in all things. We still remember like was it was yesterday the first time we met and all the potential we had; we were just full of dreams and motivation. But after 4 years we are proud of what we have done together and, best of all, we are proud of each other. 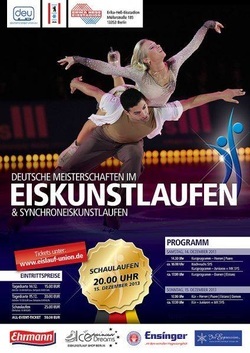 We fulfilled our biggest dream, the dream of every kid, the dream of 2 little ice dancers….being in the Olympic Games. It's rare that couples don't run into a few bumps in the road and we learned that ourselves. Our sport is based on a two people and every relationship has its ups and downs, but we always found a way moving forward thanks also to all the great people that surround us. An athletes career is not just what is look like from outside; traveling almost non-stop around the world is wonderful but leaving your home, your family, your friends, and your boyfriend/girlfriend isn’t easy. Always with a ready-to-go-luggage means sometimes you have to be ready to give up a “normal life style”. To be an athlete, you have to be resilient in pursuit of your goals. You need to love your craft and be willing to sacrifice more than most to get there. Life will always throw you curveballs when you least expect it, whether it is a family crisis, lack of money, injury, personal life, bills, etc. You need to take a swing and keep moving forward. But unfortunately, like with many things, there comes a time when you are not willing to do it anymore, and you feel like it is time to move on. We dedicate our Olympic experience to our families who were watching and supporting our performances. Our Moms and Dads who took us to practice at 4:30 in the morning, who had to sacrifice so much for us. Our friends all around the world who cheered for us. All the coaches along the way. Our relatives watching from Germany, Italy and Hungary. Every teacher and childhood friend. Every teammate. Our school, our family, our country. 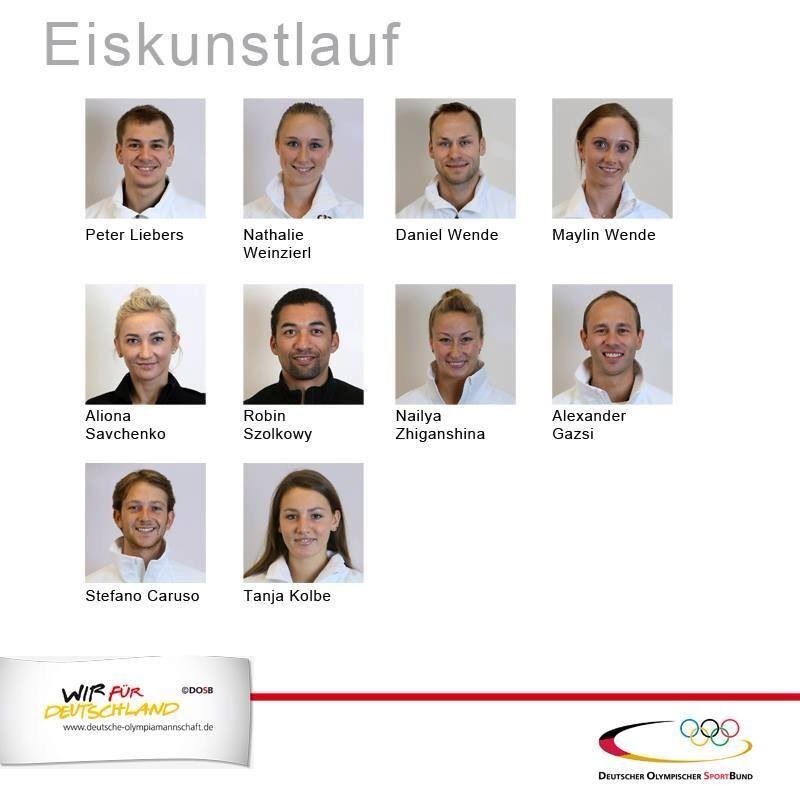 We want to thank the German Federation (DEU) for all their support in those past 4 years, especially our Sport Director Udo Dönsdorf and the Secretary Silke Köhler; the German Olympic Committee (DOSB) that gave us the great opportunity to represent our country during the 2014 XXII Sochi Olympic Games; our coaches Martin Skotnicky, Rene Lohse, Mathew Gates, Igor Lukanin, Jutta Deutschland, Corrado Giordani, Igor Shpilband and especially to our main coach Barbara Fusar Poli; without her help and her experience we wouldn’t been able to reach all the goals we fullfilled in our 4 years skating career. Our teammates, Marco&Charlene and Pernelle&Lloyd, they were our everyday motivation to keep pushing harder! We want to thank Germany that embraces Stefano as a citizen (and a soldier too) and all the people who made that possible; thank you to the Olympiastützpunkt Berlin (OSP), especially Cornelia Leukert and Reinhard Ketterer. We would like to say THANK YOU to everyone who has supported and inspired us through the years, and stood by us in this difficult decision. We appreciate and feel your love. a long, difficult and extraordinary season with highlights like the Olympic Games or the World Championships in Saitama has finished now. Like at the Olympic Games, the participants were also at the World's in Saitama extremely strong, competent and passioned. This Season had their bright and shining moments and difficult and dark ones. Though out that fact we always tried to do our best with our family and friends in the back. Unfortunately this season sometimes it was not enough. An extra big THANK YOU we want to send to all the people which supported us financially through our Aurango Project. This support helped us to prepare as good as we could for the Olympics and also already for the next season. Before we can start the preparation for the next season 2014/2015 and learn new choreography we have to do military army stages. After those stages, which will finish in the end of may, we will have a little vacation and than probably go to America for summer practice and a new choreography before the season starts in september again. So we want to thank again all our fans and supporters which made our participation at the Olympic Games and our first world figure skating championships possible and motivated us through a hard and long season. Today we picked up our clothes in Munich for Olympic Games. That was really exciting and great! We met a lot of other sportsmen from the German Olympic Team and a lot of Journalists were there. We had a couple of interviews and Photos to make and also Sky made a little interview with us. In this days before the Olympics the Interest of the media is much more than normally and we enjoy it actually. It's pretty interesting and fun. Also this week we will have some more interviews and fotoshootings. The anticipation for the Olympics is growing day by day and we get excited more and more. A few days before this Europeans we had a really bad fall from a lift. I lost Tanja right before the landing and with the tail of the blade she kick herself into the right leg. Thanks god was not so deep and she needed just couple of stitches but we missed 2 days of practice. We are proud about our performances, both in Short Dance and Free Dance. We will keep working to be well prepared in our next competition: Winter Olympic Games in Sochi and then World Championship in Tokyo! We will keep you update, stay tuned! This 2013 is almost over!Was such a great year for us! Last 5 days in Berlin were really busy: we had training with Mr. Skotnicky, Rene Lohse and our choreographer Jutta and we did also some interviews for TV RBB and the German newspapers Der Spiegeland das Bild. Doing Fotoshooting is always fun!! For the New Years Tanja will stay in Germany while I will go back home. 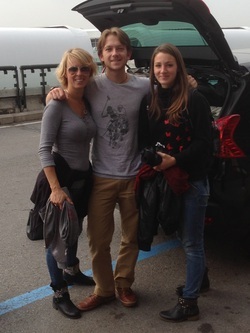 The 2nd of January already back on the ice in Milan with Barbara Fusar Poli! We wish everybody a great 2014, Happy New Year, enjoy time with family and friends!! The Year 2013 is ending pretty good for us with a great result at German Nationals 2014. We reached the second place and won the free dance. The final points we got are 145,26 with just 4,15 points to the first place. We got Level 3 and 4 in the Finnstep and we are pretty proud of that because the Finnstep is a difficult dance. Some things to improve is our midline step sequence and circular step sequence, the twizzle and of course our performance itself. From the competition we could take some advices for our programs, gain new motivation and self-confidence for the next time. We have now one month in which we can work hard and improve. A little pause we will have for Christmas and new years eve to celebrate it with our families. For the Europeans we have the goal to defend our placement from last year or reach an even better one. With hard work, the support of our fans and families and a little bit of luck we hope to reach our goals. We are approaching another big event in our season already full of great event. Saturday and sunday in Berlin there will be the 2014 German National Championship. This is an important competition for us: we want to show everybody our improvement and to confirm our performances. We are ready, we trained really hard and really good for this competition and we hope to do our best! We want to thank everybody (fans, family, coaches and friends) who are always supporting us! Tomorrow we will depart for Graz, Austria,where we have our next competition. After the Grand Prix in Japan we got some advises from judges and important personalities and changed some small things in our programms. We worked hard again and are excited now to show our Free and Short Dance to another audience and hope to perform great. We will drive to Graz in a small bus with our coach Barbara Fusar Pol and two junior teams. Its around 600 kilometers to Graz, so it will be a long journey but for sure we will have fun together. So we hope you all stand behind us and wish us good luck. Come to visit us and please help us to realize our Olimpic dreams. The competition saw the participation of some of the best ice dance couples in the world, including Meryl Davis and Charlie White (USA ) who won the gold medal . We earned the sixth place in the Short Dance (and with a level 4 in one of the sequences of Finnstep ) and the seventh in the final standings, preceded by the japanese couple, the Reed/Reed brothers. Our Free Dance was performed without any error and we were really happy with our performance but it was not rewarded by the judges in levels and scores. The competition was very difficult, also because Stephen has competed with a shoulder disorder in a fall from the bike on the eve of leaving for Tokyo and also cheered by an earthquake with a magnitude of 5.5 during the training of the Free Dance. We will keep working even harder then before, starting from the next competitions (Icechallenge of Graz, Golden Spin of Zagreb and in particular of the German Championships in December. Thanks to everyone for the support and see you soon. Sports, Christmas markets and food delicacies of every type to enliven Berlin from Potsdamer Platz to Marlene Dietrich Platz up to January 2014 in the famous show “Winterwelt in Potsdamer Platz”. We’ll have the honor, as candidates to the Sochi Olympic Games 2014, to open the event on November 2nd at 14.00. Minutes after it we’ll run to the airport to Dortmund where we hope to arrive in time to participate at NRW Trophy 2013. So, we finished in 3rd PLACE!!! We also did more than 134 points, and that is the requirement for the German Federation for the Olympic Games in Sochi!!! We are really happy with our performance in those 2 days, especially because was our first competition in this Olympic season!!! Finally 2013-2014 season begins also for us and it's really great to be back again in competition. Friday and Saturday we will partecipate at the 21st Ondrej Nepela Trophy in Bratislava where we’ll compete together a strong group of skaters. As far as we are concerned we will do our best and try to show you everything we have managed to build with months of intense work on and off ice, hoping to get a good result. We wish "good luck" to all the couples.